‘Unakku Nidu Charana pankaja paadama? Delhi le romba paada ketturkka. Nee daane vare?’ Amma would ask in a caring tone. ‘Aduttadu Delhi porom. Adukkule analum thayaar aayidu!’ Mama would enthusiastically inform me a month in advance. Amma’s concern would be about my learning the kalyani kriti and mama would constantly urge me to learn the game of cards so as to join his company atleast on the twin night train travel to Delhi. Traveling with the Sadasivams was always most welcome and an enjoyable event. Be it a car drive to Kanchipuram or the trans country train journey to the capital of India (of course, I haven’t had the good fortune of traveling with them outside the country but I have heard so much from their senior accompanists how enjoyable it always was) it was an event that I was always looked forward to. It was not just the artist in amma that was traveling with her mentor in mama. It was like a whole family traveling together on a joyous occasion. The well coordinated efforts of Atma mama, their ‘soul like’ secretary, would be like a role model travel plan worth patenting!! Mama was always particular that all of us traveled together, stayed together and returned together. This trait of togetherness was one of mama’s and amma’s innumerable virtues. As their car would enter the portico of the vintage British structure of the Madras Central station, the station manager would respectfully receive the couple. The mahavidushi, draped in the arakku bordered ‘ms-blue’ Kanchipuram silk with the fragrant jathi flowers adding value to her traditional kondai hairstyle, would walk behind the great svatantra tyagi attired in a sparkling white khaddar pancha kaccham and kurta matching his inimitable mark of vibhuti. I would walk behind them with my violin case in hand. A sense of elation of being with such an unparalleled icon of Carnatic music would pervade my constitution. As I heard the whispers of surprise that ran across the sprawling hall of the busy station and noticed every other person invariably taking a step backward to have a second glance at the god like glowing couple, the feeling of being blessed with such an association was inexplicable. We would wait at the platform amidst a trolley load of suitcases and bedrolls for the train to arrive. Though seated under a dim light on the platform, ‘Lakshmi’ and ‘Sarasvati’, the two lifeline tamburas of Amma, would ‘invite’ a few passers by to seek an autograph from Amma. ‘Avar kitta modalla vaangikkongo’, saying thus she would direct them to get it from mama first. The exclamation ‘Paavam aashaya kekkara’ would complete her signing of the autograph happily. After loading the bags on to the train and tucking in both the tamburas on to an upper berth in the two tier air-conditioned coach, amma and mama would settle down in adjacent cubicles. As the rays of the morning sun would sneak into the compartment, amma would be ready for coffee, her most favorite beverage. Vishalam, her personal aide would be on her toes and as the morning coffee session would be in progress, amma would deplore at my dislike for the south Indian speciality. At major stations breakfast and lunch, specially ordered and prepared for us would arrive. Once done with lunch, mama would gear up for his favorite pastime. A makeshift table using the suitcases and a bedspread would appear in the aisle in mama’s cubicle and the card game would commence with Prasad Anna, Nagarajan mama and sometimes Radha Akka constituting the group along with mama. Mama would remember his instruction to me a month back and would ask me again if I would join. I would excuse myself for not having learnt the game and mama, lamenting yet another time would say ‘enda ammakku pakkavadyam vashikkare. Enakku pakkavadyam vashikka kudada?’. I would smile and say ‘mama, next time’. The game would go on and on. Mama would rule the roost each session and his cross-legged sukhasana position would remain intact until evening! Amma would rarely nap in the afternoon. She would share most of her experiences both on stage and off stage and one would be awestruck to hear these memorable experiences. The topics would range from sangitam to social issues. She would recollect how her mother groomed her, the rigorous practices that she used to do of the akaras and the varisais to keep her divine voice in good shape, her initial concert experiences with her mother accompanying her on the vina, and later her concerts for many a vidvat sadas, her migrating to Madras, her training under the doyens of the music world such as Musiri mama, Semmangudi mama (infact he was amma’s paatu vadyar and mama’s cheetu vadyar! ), Brinda amma and a host of others, her acting skills in movies, especially ‘Meera’, the accolades and recognition from all over the globe, the philanthropic mind of mama and her, and her blessed experiences with the Sage of Kanchi, Shri Chandrashekharendra Sarasvati and Bhagavan Shri Satya Sai Baba. One would feel so inspired and rejuvenated to listen to her narrations. 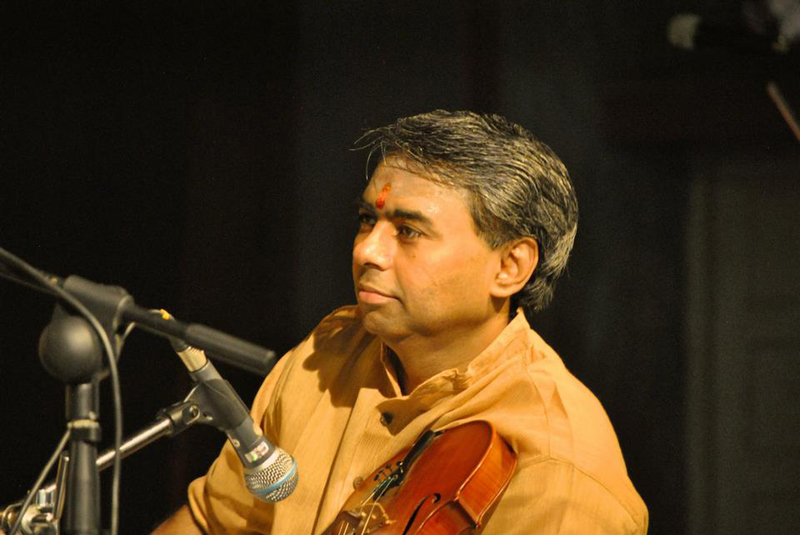 While talking about one of her cherished concerts for the Music Academy, when she sang a pallavi in the raga Begada, learnt under Musiri mama’s guidance with Shri Tiruvalangadu Sundaresa Iyer accompanying her on the violin, amma recollected how amidst the great vidvat sadas assembled for her concert, the mahavidvan Shri Karaikudi Sambasiva Iyer came up to the stage and complimented amma saying ‘Subbulakshmi, nee veenaya kanthatthulaye vechindu irukke’. While she learnt a few tumris along with Radha akka from Smt Siddheshwari Devi, amma would demonstrate how both of them had to keep singing the raga scale in different kalams until Smt Devi finished counting her rosary during her japam! Amma would cite innumerable instances of how her dedication to the divine art gained her much recognition from the pamaras and the panditas alike. Ultimately she owed all of what she was to Goddess Minakshi. It was at that hallowed shrine, she reminisced once, when she had been there with her mother and sister as a small little girl, she was singled out from the crowd by a wandering sadhu and he declared in a divine trance that she would attain great heights. Never would she fail to mention how much mama had contributed to her life. ‘But for him I would not be what I am today’ she would say in all reverence soaked with emotion. Her penchant for glass bangles, perfumes and flowers was something unique. Every time I mentioned that I would be going to Madurai for a concert, amma would tell me in all excitement as to how one could get excellent glass bangles at the entrance of the Minakshi shrine. She would feel immensely happy if somebody got her the glass bangles, specially the dark red and green shades. Similarly she was extremely fond of good perfumes and flowers, jasmine in particular. Amma would talk about how a family should function, especially the womenfolk. She would accept the dynamic woman of Bharatiyar’s poetry but at the same time would advise that she be in line with the ways of her husband. It was really amazing that, even as such great celebrities, their life style was simple, lofty in ideal. Amma and mama would then retire to bed early after dinner. Lying on my berth with the thoughts of the afternoon conversations with amma reverberating in my mind I would thank the Almighty from the bottom of my heart for having bestowed on me the blessed opportunity in life to be with amma and partake of her blissful music. After the splendid heart rendering niraval that amma sang at the line ‘o jagajjanani’, drenched in the nectar of kalyani at the concert in Delhi, I was reminded of the king Parikshit who got his name because he saw the Lord while he was still in the womb. After all, I have also grown up with amma’s music right from when I was in my mother’s womb! She sang for my mother’s simantam !! !